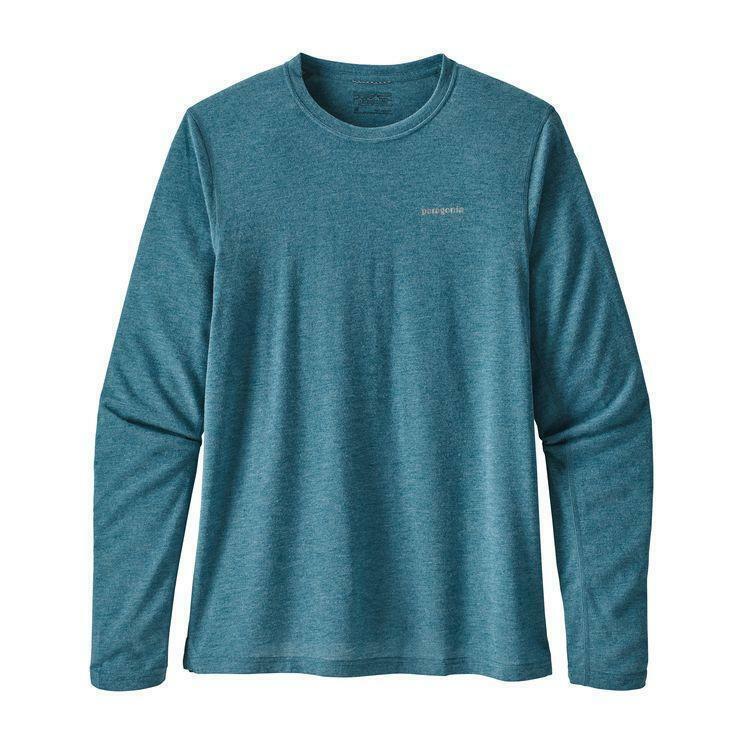 Patagonia Mens Long-Sleeve Gamut Shirt - Closeout - The Long-Sleeved Gamut is made of a lightweight polyester/spandex jersey blend, with seamless variable knit mesh zones for ventilation and chafe-free comfort. When the days shorten and the temperatures drop, keep the spirit and keep running - just reach for more coverage. Our new Long-Sleeved Gamut delivers with a superbly fast-wicking and breathing fabric to keep you dry and comfortable, whether worn alone or as a baselayer for colder runs. The shirt uses a variable-knit seamless blend of 95% polyester (75% recycled) and 5% spandex, and its design exemplifies functional simplicity. Features include mesh zones for ventilation, 25-UPF sun protection and so few stitches it's practically seamless - no chafing. With Gladiodor(R) odor control for the garment and no tags for itch-free comfort. Details Polyester/spandex jersey blend and mesh knit fabric provide maximum breathability, chafe-free comfort and great fit Featherweight fabric features 25-UPF sun protection Shirt is tag-free for itch-free comfort 3.7-oz 95% polyester (75% recycled)/5% spandex seamless variable knit with Gladiodor(R) odor control for the garment 141 g (5 oz) Made in Israel. On Sale. Free Shipping. Patagonia Men's L-S Gamut Shirt DECENT FEATURES of the Patagonia Men's Gamut Long Sleeve Shirt Polyester/spandex jersey and mesh knit provide maximum breathability, chafe-free comfort and great fit Feather weight fabric has 25-UPF sun protection Tag free for comfort The SPECS of the Patagonia Men's Gamut Long Sleeve Shirt Slim fit Weight: 5 oz / 142 g 3.7-oz 95% polyester (75% recycled) 5% spandex seamless variable knit with 25-UPF sun protection and Polygiene permanent odor control This product can only be shipped within the United States. Please don't hate us. Patagonia's Gamut Long Sleeve Shirt is a true two in one. 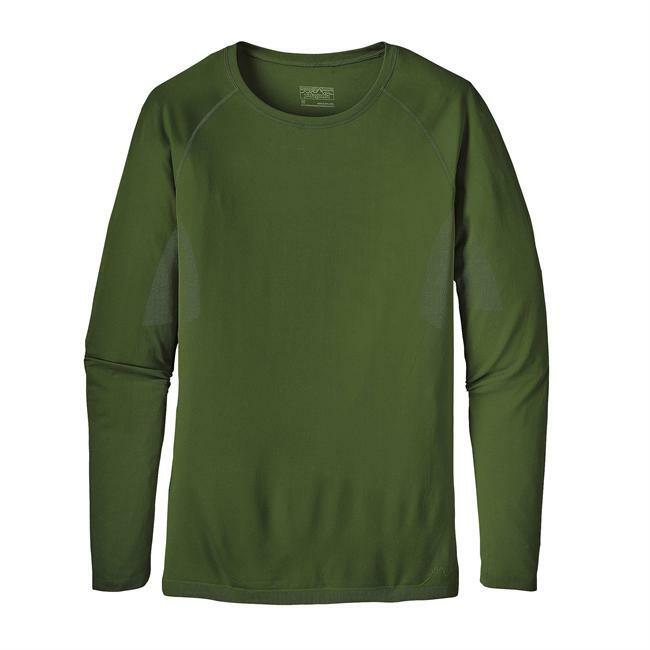 On warmer days, it works great as a lightweight, wicking, stand-alone top. 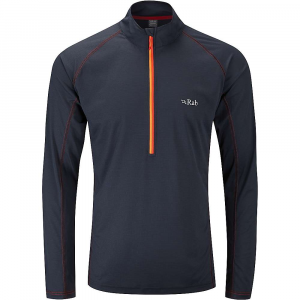 On cold days, flat seams make it perfect for use as a baselayer, giving you excellent comfort and moisture management. With Gladiodor technology, you don't have to worry about building up a stink by the end of the day. 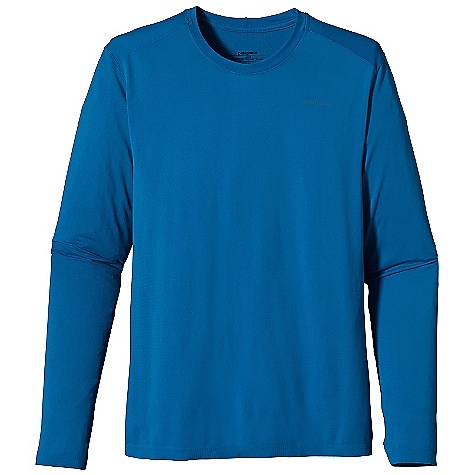 From epic trail runs to long hikes, pull on the Patagonia Men's Long-Sleeve Gamut Shirt. The ultralight polyester fabric wicks away moisture and dries quickly while strategic mesh knit zones provide ample ventilation. The shirt is even treated with Gladiodor to prevent man-stink from scaring off potential friends. 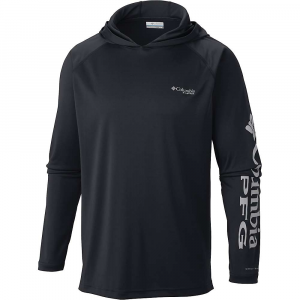 The Long-Sleeved Gamut is made of a lightweight polyester/spandex jersey blend, with seamless variable knit mesh zones for ventilation and chafe-free comfort. When the days shorten and the temperatures drop, keep the spirit and keep running - just reach for more coverage. Our new Long-Sleeved Gamut delivers with a superbly fast-wicking and breathing fabric to keep you dry and comfortable, whether worn alone or as a baselayer for colder runs. The shirt uses a variable-knit seamless blend of 95% polyester (75% recycled) and 5% spandex, and its design exemplifies functional simplicity. Features include mesh zones for ventilation, 25-UPF sun protection and so few stitches it's practically seamless - no chafing. With Gladiodor odor control for the garment and no tags for itch-free comfort. 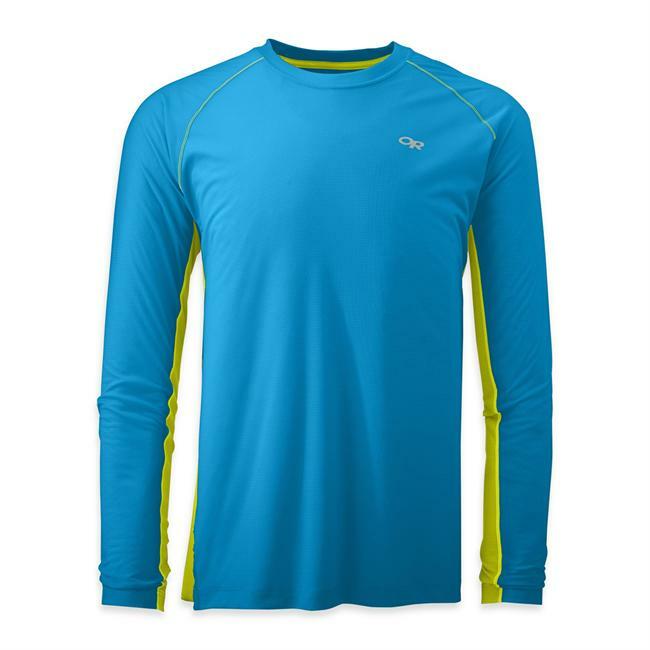 Polyester/spandex jersey blend and mesh knit fabric provide maximum breathability, chafe-free comfort and great fit. Featherweight fabric features 25-UPF sun protection. Shirt is tag-free for itch-free comfort. 3.7-oz 95% polyester (75% recycled)/5% spandex seamless variable knit with Gladiodor odor control for the garment. 141 g (5 oz). 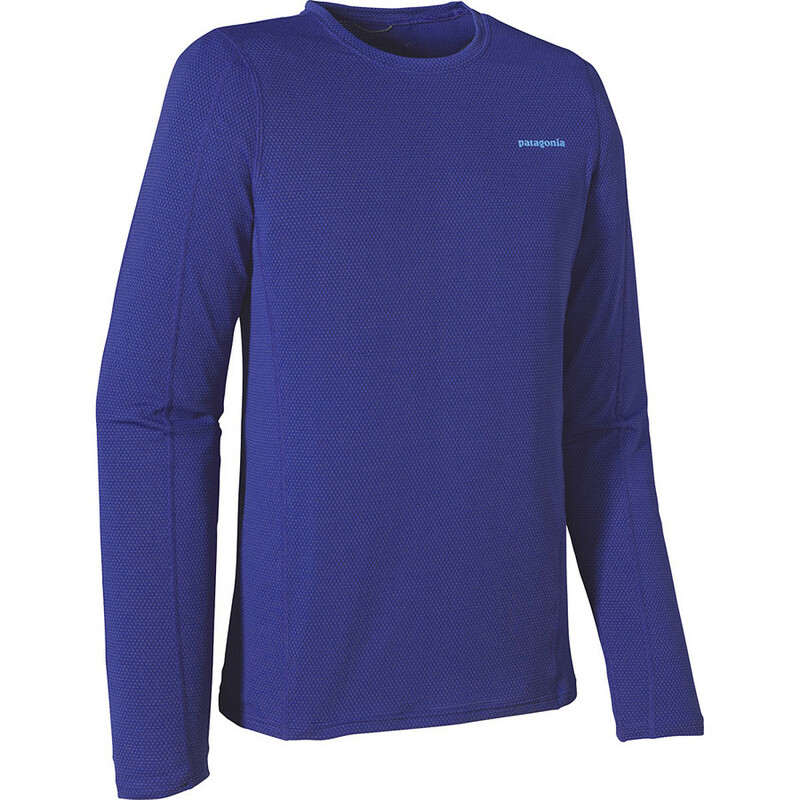 The Patagonia Men's Long-Sleeved Gamut Shirt is not available from the stores we monitor. It was last seen March 21, 2014	at Massey's Outfitters.